The patient was a 27 year old man who died in 1948. Three days before admission he had sudden onset of pleuritic pain on the right side of his chest. He also had a cough with blood-stained sputum. On examination he was flushed and pyrexial. His respiratory rate was increased and there were signs of marked consolidation of both the left and right lungs. He died the day after admission despite large doses of penicillin. 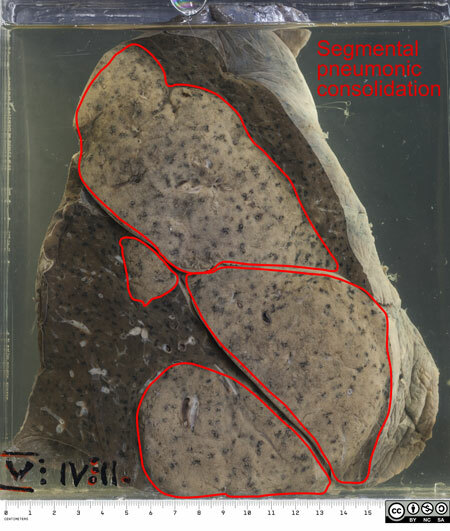 The specimen is his left lung which has been partially sectioned to show the grey-white areas of pneumonic consolidation. These areas are not typically lobar (affecting the whole of a lobe) but rather lobular or segmental, that is affecting parts of the lobes. This is said to be typical of Klebsiella pneumonia. There is a milky-looking fibrinous exudate on the pleural surface of the lung, seen here on the hilar aspect. No pneumonia can be accurately identified without microbiological investigation. A gram negative bacillus with culture characterisitics of Klebsiella pneumoniae was isolated from both lungs. K. pneumoniae produces large, mucoid colonies after 24 hours of aerobic incubation. 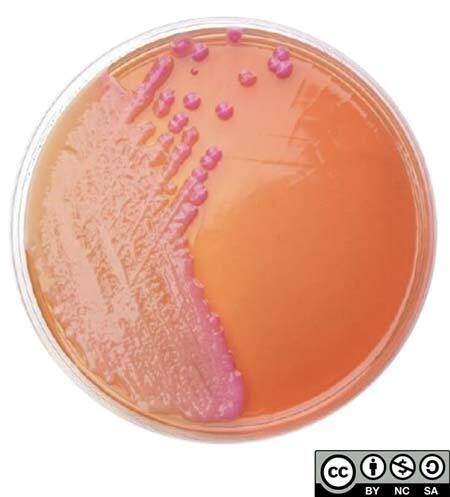 It is a lactose fermenter so on MacConkey agar the colonies are pink, as shown here. 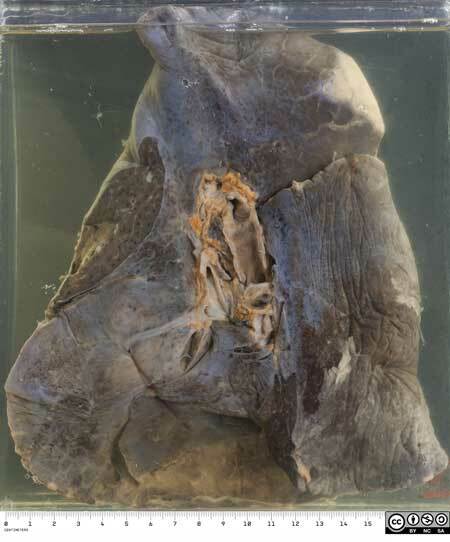 The mucinous quality of Klebsiella would be noted by the pathologist at post mortem; the cut surface of the lungs appears mucinous and the knife used for sectioning would be sticky with mucous. Klebsiella pneumoniae and Klebsiella pneumonia are sometimes still called Friedländer’s bacillus and Friedländer’s pneumonia respectively, after the German physician Carl Friedländer, who described them in the 19th century. Klebsiella pneumonia typically occurs in men over 50 years with an underlying chronic condition such as alcoholism or diabetes. It is an aggressive pneumonia and has a tendency to progress to abscess formation.